I want to present four ways in which we can try to understand what was happening then (in the time that Peter Ministered), and what can happen now. I have called the four models I have selected, Intercession, Intermediary, Incarnational, and Internal. A model is just a simplified attempt to describe complex relationships. Each of the models has elements which conform to the biblical revelation, but they demonstrate varying degrees of ‘fit’. Models are simply attempts to describe; they are not truth constructs, so please do not treat them as such. 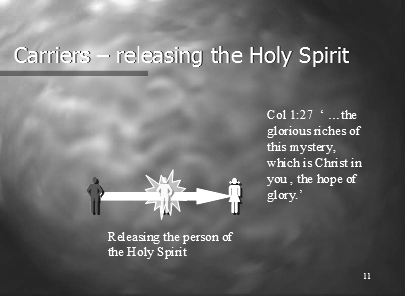 The ‘exploding star’ at the middle-left of the diagram represents the person of the Holy Spirit. The little figure on the left represents the one ministering, and the figure to the right represents the one receiving ministry. 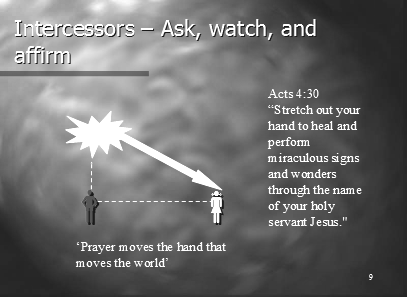 In this model, the minister asks for healing on behalf of the person who requires ministry (intercessory prayer). God responds to this prayer by directly ministering to the person in need. The intercessor observes what God is doing and affirms this to the one receiving the ministry. This appears to have been the expectation of the early disciples when they prayed, “Stretch out your hand to heal and perform miraculous signs and wonders through the name of your holy servant Jesus.” (Acts 4:30) However, the account in Acts goes on to say that, “After they prayed, the place where they were meeting was shaken. And they were all filled with the Holy Spirit and spoke the word of God boldly.” They asked God to silence their critics with a mighty display of his power, but instead he filled them with power so that they could testify effectively. He confirmed this by manifesting his power to the disciples, not to people who were threatening the disciples. Some of those who understand things primarily in terms of this model believe that ‘prayer moves the hand that moves the world.’ It is but a short step from this position to ‘prayer moves the world’. Of course, God can and sometimes does minister directly and in great power, but does this model adequately describe how Jesus and the apostles ministered? This model probably best describes how the majority of today’s Christians understand ministry. Pray and ask God to intervene, and perhaps he will. Of course, this is sometimes what happens, and we must not deny this. However, there are other ways of understanding anointed ministry. 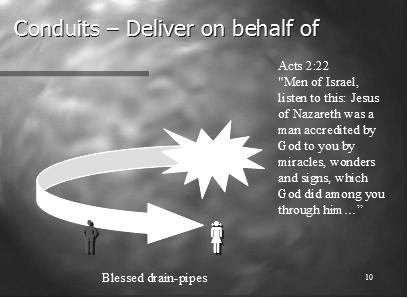 In this model we, the human ministers, serve merely as conduits for the power of the Holy Spirit – ‘blessed drainpipes’. God ministers to the needy through us. He pours living water into the recipients, and we are the conduits. This model is often merged with the previous one. We intercede in prayer for the needy person, and the Holy Spirit then ministers in power through us. Acts 2:22 tends to support this model, by stating that God (the Father) accredited Jesus by performing miracles through him. God can and does work through human delivery agents. But, once again, does this model adequately describe how Jesus and the apostles ministered? Another way of understanding Acts 2:22 is that Jesus was the full representation of the Godhead to humanity (Colossians 1:19), and as such God was working ‘through’ him in this sense. So, this text does not necessarily support the Intermediary Model. The idea here is that the person of the Holy Spirit resides in all born-again disciples of the Lord Jesus Christ. Therefore, we are not so much filled with the power of the Spirit, but we contain the Person of the Holy Spirit. When we minister in Jesus’ name, then the Holy Spirit works out from within us to effect the healing, or whatever else is needed. Some even go so far as to claim that we need to ‘release’ the Holy Spirit. I find this concept bizarre almost to the point of blasphemy! How can we honestly think that God the Holy Spirit is subject to our will, and can only operate if we give him permission?! However, the more common understanding is that as we mature and yield more and more control to the indwelling Holy Spirit, then he works more powerfully in and through our lives. Having said all this, the model of the indwelling presence of the person of the Holy Spirit is probably the most commonly accepted of all the models by the more conservative elements within the evangelical church.